My custom version of an alarm panel hoping to bring many new features at the request of fellow patrons. Please contribute to this thread and submit your requests, suggestions, ideas and pitfalls!. Weather Status (Optional) - NOTE: You must have dark sky weather component enabled specifically sensor.dark_sky_summary. Perimeter Mode (Optional) - Allows you to part activate the alarm in Home Day mode. I use this to only arm a particular set of sensors (doors) whilst I’m using all floors. Possibly a full black one with a Cylon style bar when activated? Follow this guide to setup google assistant if you haven’t already done so. UK Alarms for HA - Recomentations? 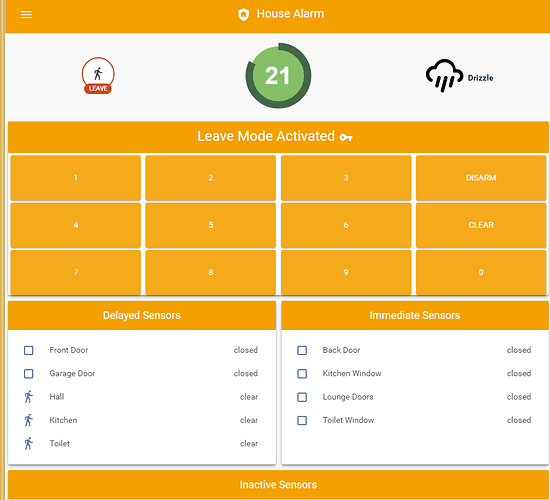 Alarm panel integration to HA - local only? Manual Alarm armed_custom_bypass mode example? Sonoff-based (?) home security system - where to start? How to play XIaomi Gateway ringtones sound in loop? 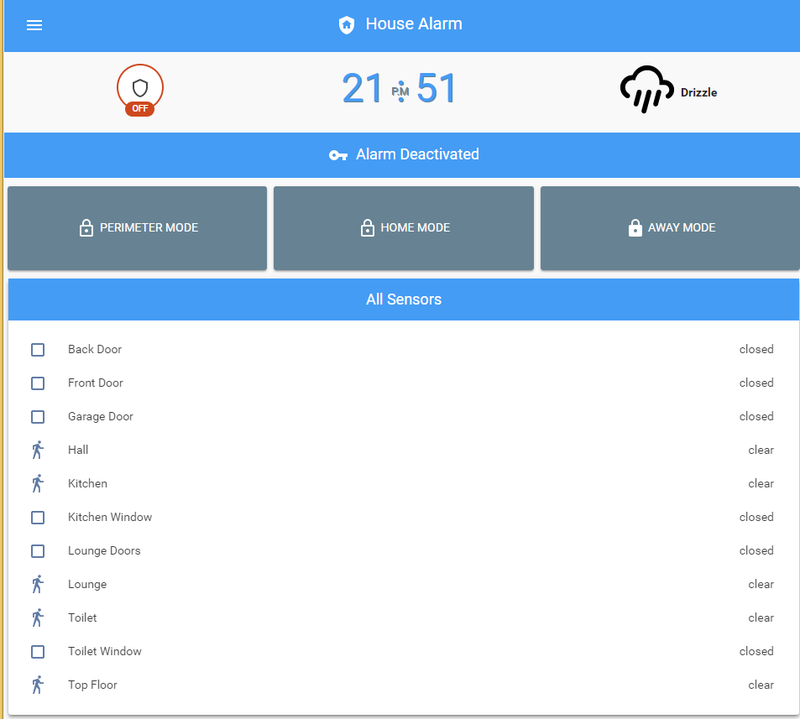 How can the alarm system be supported by Home Assistant? Can't activate all alarms through HADashboard? don’t know if this possible to have the breached sensor name showing a bit cleaner, seems it’s not using the friendly name? Hi gazoscalvertos, I’m a bit of a noob and probably missing something simple. I use the below code for my automations. The alarm works perfectly fine in Away mode, however when using Home mode. I do not get the notifications nor do I get the siren sound as I would in away mode. Maybe I’m missing something? ‘Delayed’ - Sensors in this group will trip the alarm but will not activate the siren/trigger state until after the ‘pending_time’ period unless the alarm is deactivated. ‘Immediate’ - Sensors in this group will activate the siren/trigger state immedilately when tripped. 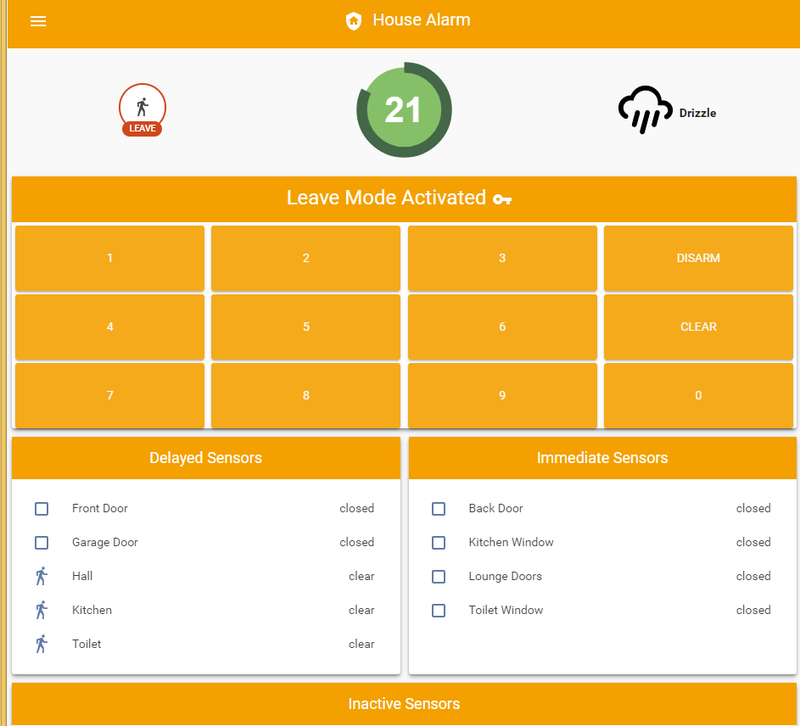 ‘Homemodeignore’ - Sensors in this group are ignored completely when the alarm is set in home mode. This allows you to 'partially ’ set the alarm. Without testing or checking the code I’m not sure if switch would work. I would advise you to to setup the automations as you will need them in order to deactivate however the siren if you are using one. 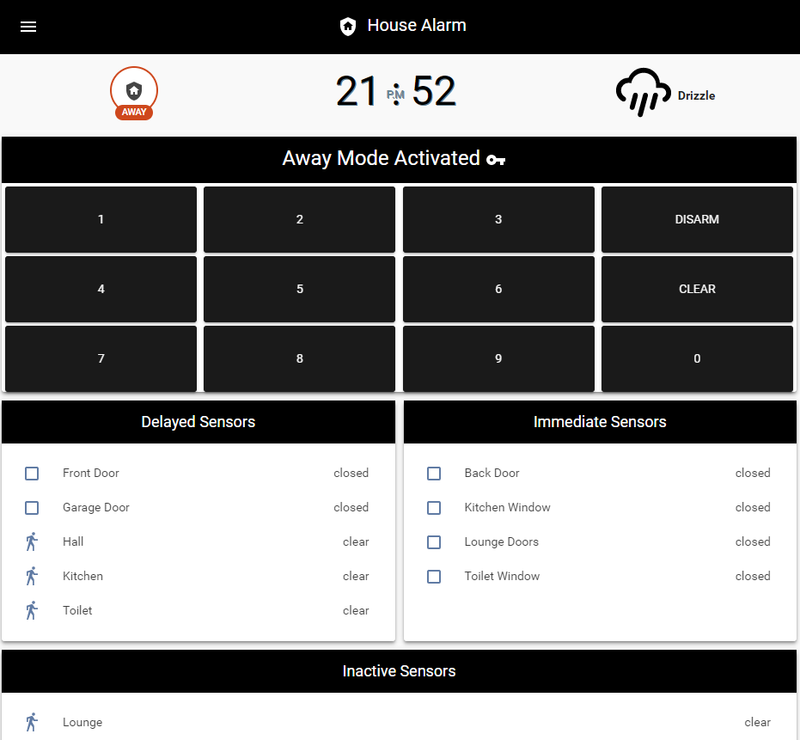 Is it possible to somehow setup an automation for alarm pending like a sound or something? 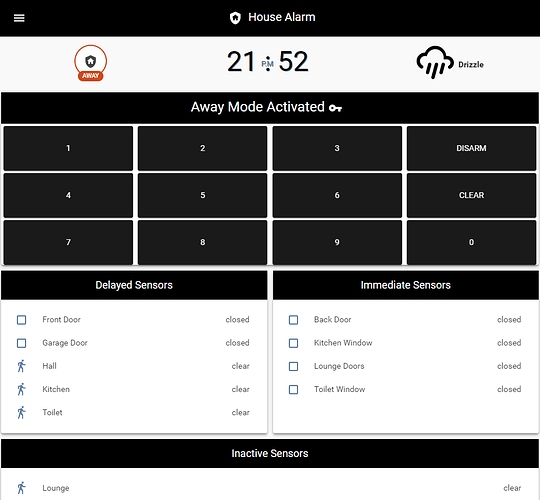 Add alarm_control_panel.house to group.yaml then it will allow you to click and add the code using free text. I’ll implement the 0 in the next release. Now i have automation based on te state of alarm. I cant undertand what your code does. This code takes care of the automation inclusion for the sensors providing you have set the groups up in alarm.yaml so there is no need to list each sensor in the automation.yaml. All you need in automation.yaml is actions to trigger siren/notifications/sounds/etc and ones to disable siren. I’ll upload a sample automation.yaml to the github tonight.